Midterm elections may not generate the same level of interest with the public that presidential elections do, but they’re still important. Next Tuesday, all 435 seats in the House of Representatives are up for election, as are U.S. Senate seats in 33 states. The results of that vote will determine whether Democrats are able to keep control of the Senate, whether Republicans will continue to run the House and – just as importantly – the people who will represent you personally in Washington, D.C. 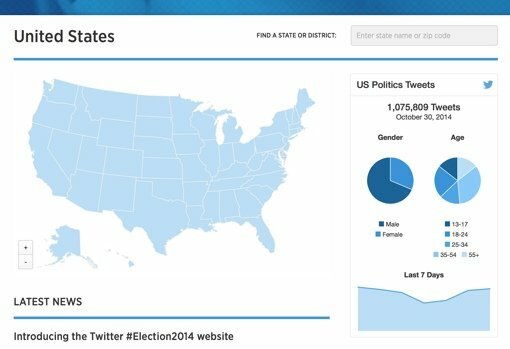 If you need help keeping track of the nationwide action, Twitter this week launched a cool new election resource called the #Election2014 dashboard. There, you’ll be able to see what issues people are talking about nationwide at that moment (right now, Obama, ISIS and law enforcement are top topics). You’ll also be able to review the top tweets about campaigns, and access links to the Twitter accounts of key national figures like Senate Majority Leader Harry Reid and groups like the Republican National Committee. If you’re more interested in your local races, you can use the interactive map to visit a state-specific dashboard. As you’d expect, you’ll find the top tweets pertinent to Senate races, House races and the issues that matter to your community. You can also drill down by congressional district to get links to candidates’ Twitter accounts so you can follow them directly. You can access the new #Election2014 dashboard by navigating to election.twitter.com. To learn more about the dashboard and its features, check out the official Twitter blog. And remember to head to the polls and vote next Tuesday – it’s your civic duty!